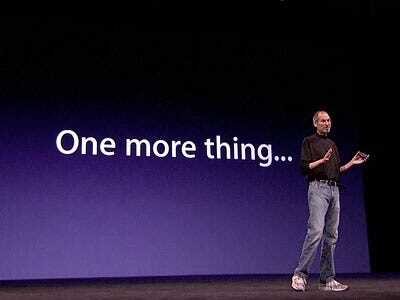 In addition to new iPods and a new TV-watching device, Apple could introduce a new social network tomorrow. Look out, Facebook! Okay, it’s not a big, elaborate Facebook killer, so Mark Zuckerberg and company don’t actually have much to worry about. But Apple’s “Game Center” might take some of Facebook’s juice away in iPhone gaming, which could be a drag. Apple has been preparing a social gaming network for iOS apps for months. The company gave a preview of Game Center at an event in April, and we expect to hear more about it at Apple’s iPod event tomorrow. The iPod touch — arguably Apple’s flagship gaming device — is due for an upgrade, and now seems like a good time to launch Game Center. The basic features Apple announced in April include the ability to invite friends to play a game against you; have the servers match you up with a random person of the same skill level for a game; leaderboards; and achievements. We assume you’ll have a basic profile, and will be able to add friends in various ways, as other social gaming networks function. Apple isn’t the first to launch a social gaming network for the iPhone: Several already exist, such as Ngmoco’s Plus+, OpenFeint, and others. Presumably, Facebook would want to have a play here, given how successful its gaming platform has become on Facebook itself. But the idea is that an Apple-made social network, built right into the OS, could be more universally adopted, and not under the control of a single studio. (Who knows, those third-party systems may even link into Game Center at some point.) Bigger picture, better social gaming on the iPhone could make it a stronger competitor not just to other phone platforms, such as Android and Microsoft’s forthcoming Windows Phone 7, but also to handheld consoles like the Nintendo DS and Sony PSP. And if Apple’s new living-room gadget has gaming elements, Game Center could be useful there, too. So what’s coming tomorrow? It’ll be interesting to see if Apple got any of the big studios, such as EA or Gameloft, to adopt Game Center. It’s easy to implement, we hear. It’ll be interesting to see if Facebook login and social graph integration is ever part of the Game Center roadmap. It’s not part of the first version, we’re told by someone who has played around with it. Xeesm Appsworld is maturing and we are running first alpha tests with third party developer. We expect to open up APIs and the AppsWorld platform to external developer by end of the year. Xeesm/Appsworld already today provides a social business application platform and a series of applications including social relationship management, social customer engagement, a social address book and many other social business application. Take a fresh look at how to best leverage social networks. - Tools including Xeesm/Flights! or Xeesm/Edge! to manage relationships in the context of projects, campaigns, initiatives etc. Check out the latest applications including Xeesm/Compete! and another third party product: TweetScrambler. I just came back from Australia where I spoke on several events about Social Business, it’s evolution and where we go in the next few years. It was great to see how advanced Australia is. Wherever I went, people are on LinkedIn, Facebook, many on Twitter and the days where most of those platforms where some exotic place for geeks are clearly over. Like Australia also Europe and Asia is booming. I recently worked with some European companies and it isn’t any different. Social Media is becoming an integrated part of a business strategy.